How are you using your HSoS? You probably wonder what is HSoS? It stands for “Hottest Spot on Site“. HSoS is a spot on an URL that is most noticeable. It’s not to be confused with spot / spots that get noticed first, it’s simply a spot that stands out the most on a website, no matter how long you stay on it. The best use for HSoS is a call to action. It sounds pretty basic thing, but I saw lots of websites that have completely useless stuff on their HSoS. Let’s have a look at some websites that used their HSoS really well. 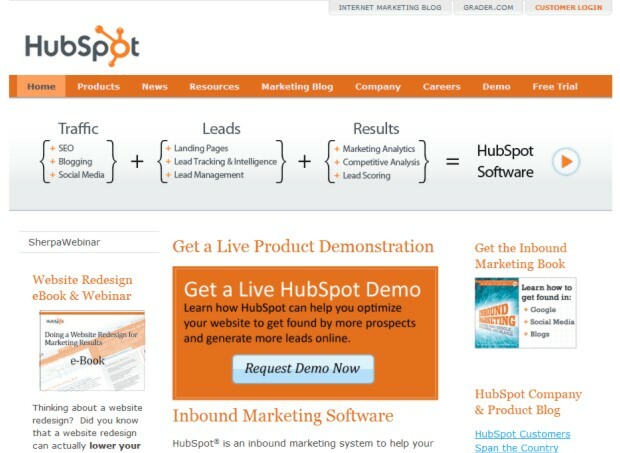 No matter how long you stay on the site, “Request Demo Now” button in the middle of the site remains the HSoS. They used it perfectly. They could have put just about anything there but obviously they believe that most important thing for a visitor to do when they arrive is request a demo from them. Just look at this Buy Now call to action. It’s totally a HSoS and a really good use for one I might add. We worked on this project, there were lots of Google Website Optimizer tests performed and we’re still doing some. I’m not sure if the input field or the “update” button itself is a HSoS here but in either way it’s the best possible use of HSoS for this service. Probably the most important factor of Twitter’s success was a great use of call to action in their HSoS. How do you use your HSoS? Is there a call to action on your website that stands out the most or is there something else that occupies your HSoS?